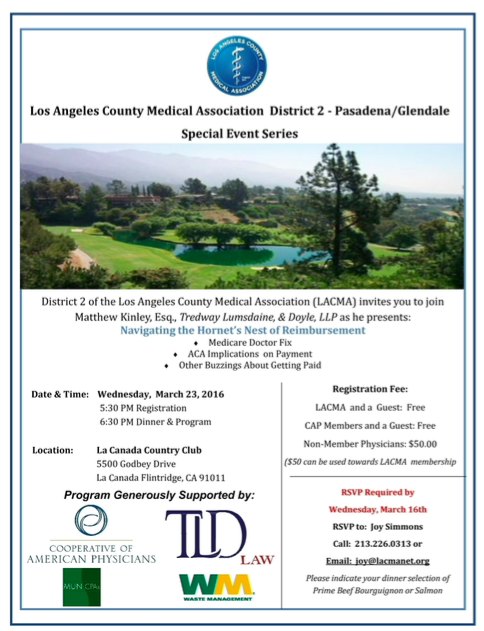 Matt Kinley Speaks to Los Angeles County Medical Association on March 23, 2016. Contact Mr. Kinley at mkinley@tldlaw.com if your interested in attending. This entry was posted in Accountable Care Act, Anti-kickback, Current Affairs, Healthcare Regulatory Matters, Medical Insurance, Medicare, Physician, Physician Assistant, physician compensation, telehealth, Uncategorized. Bookmark the permalink.